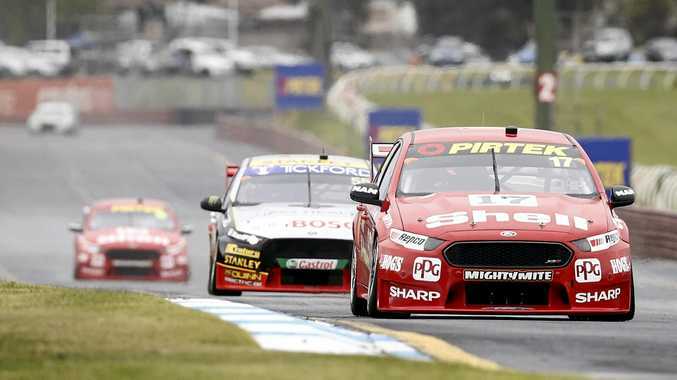 THE rain gods have delivered DJR Team Penske and Scott McLaughlin a major boost as he continues his hunt for a maiden Supercars title at the Sandown 500. The Ford team were among 10 cars to make the courageous decision not to pit for wet weather tyres when a deluge hit the co-drivers' qualifying race on Saturday. They reaped the rewards when the shower cleared just minutes later, getting home on slick tyres ahead of the cautiously minded pack. Aaron Russell, co-driver to Nissan's Andrew Heimgartner, was first home ahead of reigning Bathurst champion Luke Youlden, who was partnered once more with David Reynolds. The Penske duo of Alex Premat and Tony D'Alberto, co-drivers for McLaughlin and Fabian Coulthard, were third and fourth. But in a potentially title-shifting moment, series leader Shane van Gisbergen's co-driver, Earl Bamber, opted for wet tyres and came home in 16th, well behind McLaughlin. "Sometimes you need a little luck to come your way," said McLaughlin, second in the driver standings, after anxiously watching his teammate steer the No.17 Falcon home. "It was a little dicey. They chose to stay out ... that was a tough decision. It was crazy, well done to him." The hail landed in Melbourne just seconds after a safety car left the track. Warren Luff, who stalled off the grid, appeared to hit Jason Bright, sending him into the fence down the main straight. James Moffat, driving with Chaz Mostert, was also collateral damage in the conditions. He was shunted from second place into the grass for a 10th-place finish. Pacesetter Paul Dumbrell was the best finisher of those who came in for wet tyres, finishing 11th. If the finishing positions were replicated in Sunday's 500km race, McLaughlin would erase his 19-point championship deficit to van Gisbergen and move to a 125-point lead. But there's still a long way to go before the championship points are handed out in Melbourne. Later on Saturday, the main-game drivers return to their cars for a final qualifying race - using the finishing positions from the co-drivers race as their grid. The 500km classic starts at 1.20pm on Sunday.